The Global Volcanism Program has no activity reports for Hasan Dagi. The Global Volcanism Program has no Weekly Reports available for Hasan Dagi. The Global Volcanism Program has no Bulletin Reports available for Hasan Dagi. The massive double-peaked stratovolcano Hasan Dagi in Central Anatolia has undergone four episodes of caldera collapse, the latest of which formed a 4-5 km wide caldera at the summit. The modern edifice within the latest caldera is the youngest of four major basaltic-to-rhyolitic volcanic complexes dating back to the mid-Miocene. Andesitic-to-dacitic lava domes form the two principal summits, of which the westernmost is the highest and is capped by two nested craters. 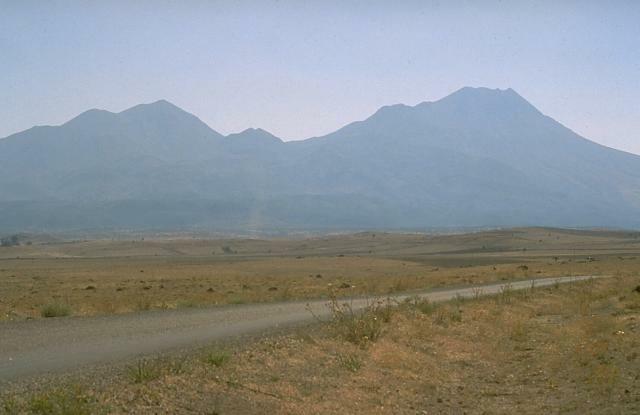 Lava domes and associated pyroclastic-flow deposits blanket more than half the flanks of the Mount Hasan volcanic complex. A group of more than 25 Quaternary cinder cones, maars, and lava flows dot the surrounding plains. Interpretations of Neolithic paintings representing eruptions are controversial, but geologic evidence supports eruptive activity continuing into the Holocene. Aydar E, Gourgaud A, 1998. The geology of Mount Hasan stratovolcano, central Anatolia, Turkey. J. Volcanol. Geotherm. Res., 85: 129-152. Brinkmann R, 1976. Geology of Turkey. Amsterdam: Elsevier, 158 p.
Deniel C, Aydar E, Gourgaud A, 1998. The Hasan Dagi stratovolcano (Central Anatolia, Turkey): evolution from calc-alkaline to alkaline magmatism in a collision zone. J. Volcanol. Geotherm. Res., 87: 275-302. Develle A-L, Williamson D, Gasse F, WAtler-Simonnet W, 2009. Early Holocene volcanic ash fallout in the Yammouneh lacustric basin (Lebanon): tephrochronological implications for the Near East. J. Volcanol. Geotherm. Res., 186: 416-425. Feraud J, Ozkocak O, 1993. Les volcans actifs de Turquie: guide geologique et itineraires de'excursions. L'Assoc Volc Europeenne (LAVE), 2: 1-82. Kuzucuoglu C, Pastre J-F, Black S, Ercan T, Fontugne M, Guillou H, Hatte C, Karabiyikoglu M, Orth P, Turkecan A, 1998. Identification and dating of tephra layers from Quaternary sedimentary sequences of Inner Anatolia, Turkey. J. Volcanol. Geotherm. Res., 85: 153-172. Meece S, 2006. A bird's eye view - of a leopard's spots, The Catalhoyuk 'map' and the development of cartographic representation in prehistory. Anatolian Studies, 56: 1-16. Mellaart J, 1967. Catal Huyuk a Neolithic Town in Anatolia. New York: McGraw Hill, 232 p.
Mellaart J, 1993. Descriptions (picturales) d'eruptions recentes du Hasan Dagi par les hommes du neolithique a Catal Hoyuk. L'Assoc Volc Europeenne (LAVE), 42: 17-30. Umran Dogan A, Dogan M, Kilinc A, Locke D, 2008. An isobaric-isenthalpic magma mixing model for the Hasan Dagi volcano, Central Anatolia, Turkey. Bull Volcanol, 70: 797-804. There is no Deformation History data available for Hasan Dagi. There is no Emissions History data available for Hasan Dagi. The massive, double-peaked Hasan Dagi stratovolcano in central Turkey has a complex history that includes three episodes of caldera collapse. Numerous cinder cones, maars, and lava flows dot the flanks of the volcano. The hilly terrain in the foreground is a debris-avalanche deposit produced by collapse of the volcano. Photo by Richard Waitt, 1994 (U.S. Geological Survey). There are no samples for Hasan Dagi in the Smithsonian's NMNH Department of Mineral Sciences Rock and Ore collection. Large Eruptions of Hasan Dagi Information about large Quaternary eruptions (VEI >= 4) is cataloged in the Large Magnitude Explosive Volcanic Eruptions (LaMEVE) database of the Volcano Global Risk Identification and Analysis Project (VOGRIPA).